This is our weekly look at fantasy adjustments you should make based on venue and/or weather. Entering Week 11 of the NFL season, knowing which players should see an improvement or decline in their projection can be a key to victory. After a slate of 14 Week 10 games that included just one in a dome, Week 11 features five dome games out of 13. That’s tied for second-most for any week all season despite the six teams on bye, and interestingly, the dome-heaviest week comes next week. Road quarterbacks like Cam Newton (in Detroit), Dak Prescott (in Atlanta), and Carson Wentz (in New Orleans) should feel pretty fortunate to play indoors past mid-November when road games tend to bring cold weather. There are still a handful of teams that will have to deal with sub-50-degree temperatures this week, and that should noticeably impact their performances especially when compared to the indoor teams. I have projected the impact of both the venue and weather for every fantasy-relevant player in Week 11 for Elite subscribers. Here are the ones I find most interesting. The Bengals/Ravens matchup is one of the four this weekend with kickoff temperatures projected to be below 50 degrees, but that is the least of the fantasy intrigue. You may be tempted to avoid the Ravens passing game because of the cold and their uncertainty at quarterback, but I recommend deciding on Sunday morning if you can wait. Joe Flacco (+2.2) has some of the most extreme home/road splits at the position. There’s no telling if Lamar Jackson will show similar splits, but whoever plays will draw a start against a fantasy-friendly defense. The Bengals are one of five teams that encourage more passing yards and touchdowns per attempt and more rushing yards and touchdowns per attempt than a typical team. They’re the only one of those five that also promotes passing and rushing plays relative to average. It’s a perfect fantasy storm. I’d probably only play Michael Crabtree (+0.9), John Brown (+0.8), or Willie Snead (+0.8) in shallow and medium formats if Flacco were healthy enough to go. I suspect a Jackson or Robert Griffin III start would shift the Ravens’ strategy heavily toward the run. Regardless of the starter, Alex Collins (+0.8) should be a decent fantasy option. Both the home start and cold weather should lead to more carries for the early-down back, and I expect Ty Montgomery (-0.2) to eat into Javorius Allen’s (-0.1) workload rather than Collins’. The Bengals’ offense is a tougher fantasy sell. They dropped 34 points on the Ravens at home back in Week 2, but they will be without the scorer of their first three touchdowns that day, A.J. Green. And even with that poor defensive performance, the Ravens have been the opposite of the Bengals for the season as a whole, limiting offenses to less-than-usual passing yards and touchdowns and rushing yards and touchdowns per attempt. Andy Dalton (+0.2) is the least home-dependent quarterback in football, but this is still a below-average venue-and-weather game because of the cold. Look elsewhere at the position. Joe Mixon (+0.6) and Tyler Boyd (-0.4) are fantasy starts no matter the matchup, but I’d try to avoid John Ross (-0.4) this week even though he led the team with six targets last week and scored a touchdown. In trying to project Ben Roethlisberger (-3.5) against the Jaguars this week, you should probably look elsewhere than his performances against them last year. In Week 6, he threw for 312 yards, 0 touchdowns, and 5 interceptions. Then in the encore in the Divisional Round of the playoffs, he went off for 469 yards, 5 touchdowns, and 1 interception. So, yeah. I’ll put my faith in Roethlisberger’s overall home/road tendencies — he has the biggest splits at the position — and the strength of the Jaguars defense. Despite regressing toward neutral across the board from last season, the Jaguars are still a minus matchup for completion percentage, passing attempts, yards, touchdowns, interceptions, and fumbles. It will likely be a tough day for Roethlisberger, Antonio Brown (-1.8), and JuJu Smith-Schuster (-1.7). The only below-freezing kickoff comes on Sunday night when the Vikings play the Bears in Chicago. Soldier Field is also forecasted to have winds pushing 10 miles per hour. 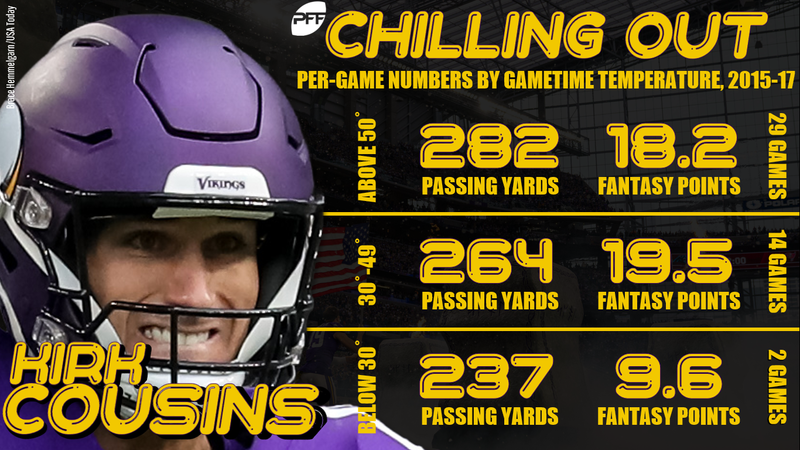 Kirk Cousins (-0.9) has experience playing in cold weather from his years as a starter in Washington, but he’s only had a pair of starts below 30 degrees and failed to throw a touchdown in either of them. The first time was on Monday night of Week 15, 2016, at home against the Panthers. The Redskins scored 15 points that day. The second was Week 17 last year at the Giants. The Redskins scored 10 points. It’s not totally fair to judge Cousins by the just two games he’s played in those conditions. But why risk it? Overall trends suggest the colder a game gets, the more a team runs the ball and the less successful pass attempts become. Hit the wire to dodge Cousins in the trifecta of a road game in bad weather against a formidable pass defense in the Bears. The most discussed conditions of the week belong to the Monday night game between the Chiefs and Rams. Apparently, Estadio Azteca’s field was not fit to host the game, and so it has been moved last-minute from Mexico City to Los Angeles. I can only guess how bad turf would impact fantasy production, and the weather would have been fine at either location, but the change should still have a significant fantasy impact. That’s because playing at home really makes a difference, perhaps especially so for Jared Goff (+0.4). He doesn’t have an extensive career history of home/road splits like Flacco and Roethlisberger, but he’s showed extreme tendencies the last two seasons scoring 3.2 more fantasy points per game at home than on the road. 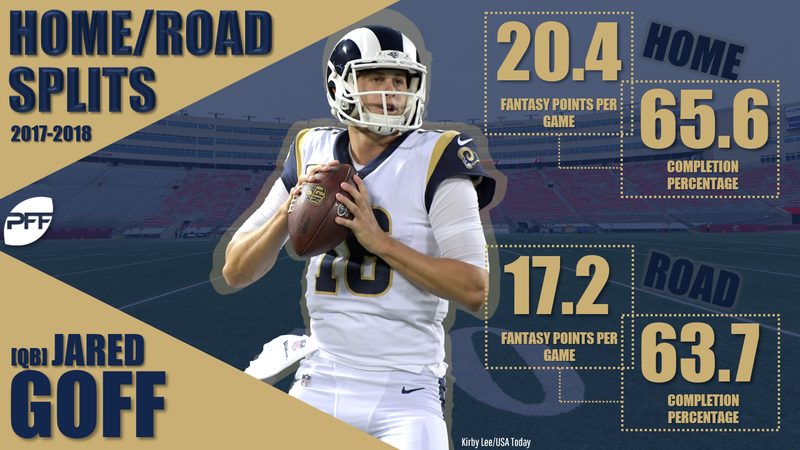 The move home upgrades Goff to an excellent play against the fantasy-friendly Chiefs’ defense. And of course you’ll want to start Robert Woods (+0.7) and Brandin Cooks (+0.6), who will enjoy even more work with Cooper Kupp out for the season. I think it makes sense to stash Josh Reynolds (+0.3) and Gerald Everett (+0.3), too, and you could play them in a pinch in a deeper format or in a daily contest.